The great promise of the 20th century was that everything would one day be operated by push-button. 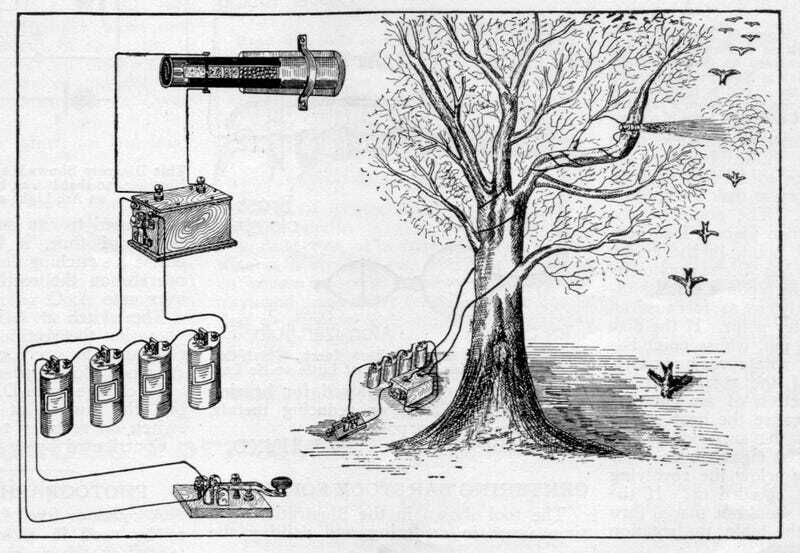 Even hunting was supposed to become automatic, as you can see in the invention above from 1922. The May 1922 issue of Science and Invention magazine included this contraption which promised "hunting without firearms." A telegraph key was wired to some batteries, a spark coil, and a shotgun cartridge. With enough wire, the device would become the ultimate lazy-hunter's dream. Or that was the idea. One can't help but imagine the nightmare scenario where an unfortunate passerby gets sprayed with buckshot when Little Johnny discovers the telegraph key his dumbass father installed in the nursery. A piece of steel adapted to hold a buckshot cartridge is clamped to any immovable object such as the limb of a tree, and directed toward bait placed on another branch. If desirable, several of these steel barrels may be employed. The cartridge is then perforated near its powdered end, and two small nails or pieces of pointed metal rod are inserted. Copper wires are twisted around these nails, and then brought downward along the trunk of the tree. At the root of the tree a one-quarter inch spark coil is secured, and the wires from the cartridge are attached to the secondary terminals. A storage battery is placed alongside of the spark coil or dry cells may be employed. Two wires then lead away to the distant key. The birds may now be observed thru telescopes, field glasses, or just the naked eye, and the key pressed pronto! Needless to say, you probably shouldn't try this at home.